Just when you’d think that everything that was major for a coin over 20 years old could have been found, up pops a beautiful 1988 Doubled Die Obverse cent that vies that of the famous 1984 cent. The doubling on the 1988 is very strong on the earlobe. Christopher Beck of FL originally reported the variety to error-variety coin specialist Billy Crawford of SC in early May. Crawford then purchased the coin and eventually sent it to me for my own examination and an opportunity to photograph it. 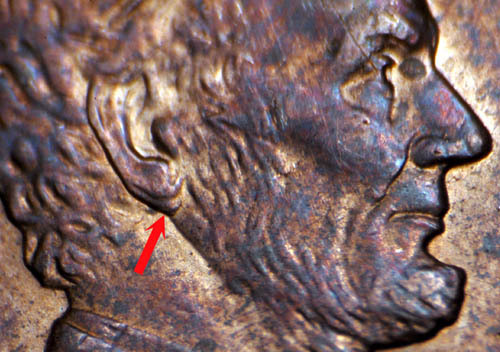 The doubling of the earlobe on this new variety is very similar in strength to that evident on the 1984 Doubled Ear cent that has been listed in A Guide Book of United States Coins nearly since it was first discovered by Richard Austin in the same year. 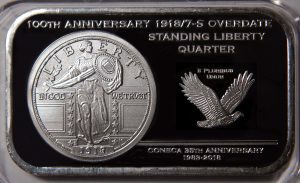 Additionally, it is even stronger than that of the 1997 Doubled Ear cent now listed in the A Guide Book of United States Coins — Professional Edition. However, there are significant differences between all of three of the coins. 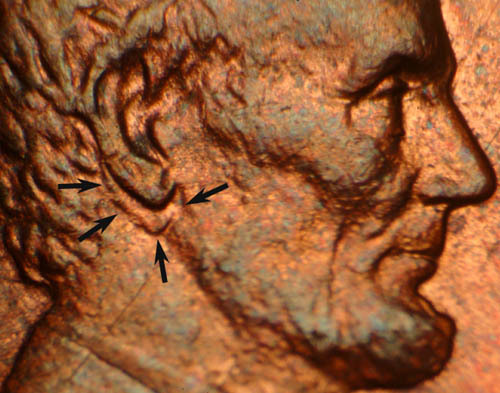 The doubling on the 1984 cent is the result of an Off Set limited pressure tilted hubbing that allowed the doubling to be more extensive, effecting not only the earlobe, but also Lincoln’s beard, bowtie, vest and other areas. The 1997 also sports more extensive doubling but beyond the earlobe none of it is easy to see. The 1988 is the probable result of a Tilted Hub doubled die with doubling restricted to just the earlobe. In spite of the fact the doubling is less extensive on this variety than on the other two well-known doubled-ears, in my opinion this one should be considered a major variety. The earlobe is the PUP (pick up point) and is really the most important aspect on all three of the doubled ear varieties described here. I personally like this one better than the 1997 doubled ear due to its strength and I have to wonder how rare it may be considering it’s nine years older than the 1997 and is just now being reported. 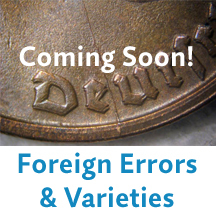 Bill Fivaz and I have slated it for inclusion in the next edition of the Cherrypickers’ Guide To Rare Die Varieties as FS-101. I am the editor or CPG while Fivaz is coauthor with JT Stanton. It has also been listed by CONECA, John Wexler, Billy Crawford and CopperCoins.com. 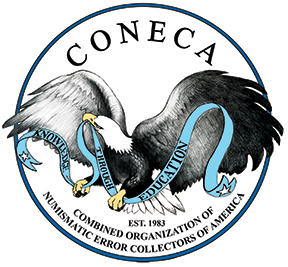 The CONECA is DDO-003, Wexler is WDDO-009, Crawford is CDDO-008, and Coppercoins is 1DO-010. 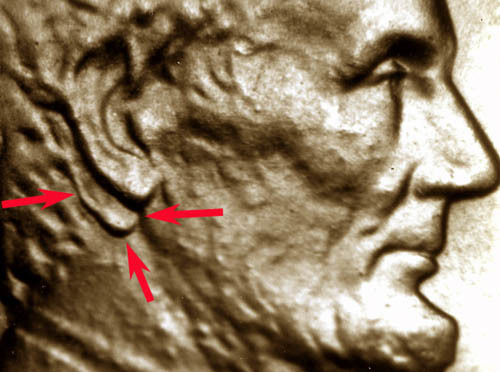 In 1997 when the first doubled die cent was discovered that was produced from dies presumed to be made via the single-squeeze hubbing process, (showing on the coin as a double earlobe), I first proposed that a tilted hub seated into position by the force of the single impression of the hub was the most probable cause. Since that time most specialists have come to agree that this is the most probable explanation for most (if not the vast majority) of significant single-squeeze produced doubled dies. However, many of us also recognized that this same scenario could have been occurring during the multiple hubbing process era during the first pass of the hub into the die blank. This coin was produced during the experimentation stages of the single squeeze hubbing process and could be the result of either process. It should be understood that the face of a die blank is machined with a slightly conical configuration to aid in the flow of metal during hubbing. This would indicate that the initial kiss of a hub into a die blank would be restricted to this centralized area before continuing on to fill out the rest of the design. During this process if the die blank was tilted slightly the tip would be positioned slightly off location away from the center of the hub into a different area of design than intended. If during this process the die blank then seated itself properly due to the pressure of hubbing, the impression would shift location and thus the misplaced area of doubling on affected dies. I thank Billy Crawford for sending in the coin!